Location: Alpha-Quadrant Span: 3. Points: 30. Special Instructions: When you complete this mission, if you have six or more cards beneath your Ferenginar, you may lose 5 points to take an additional turn after this one. 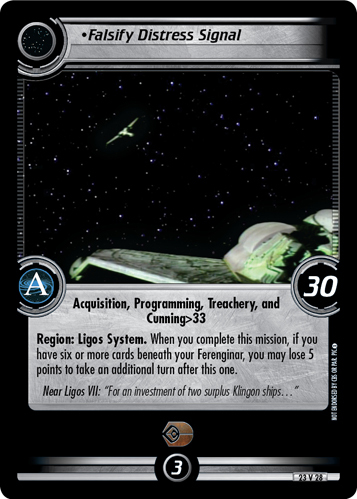 Near Ligos VII: "For an investment of two surplus Klingon ships..."
Characteristics: lose points, Alpha quadrant mission, Ligos System, space mission, worth 30 or less points, worth 35 or less points.